Why was the “Cambrian Explosion,” also called the “evolutionary big bang”? Just after the end of the Pre-Cambrian era, about 543 million years ago (during the Cambrian period), a great burst of evolutionary activity began in the world’s oceans. Based on the fossil record of the Cambrian period, scientists estimate that the number of orders of animals doubled roughly every 12 million years. At this time, too, most of the modern phyla of animals began to appear in the fossil record. For some reason, new animals appeared at breakneck speed, geologically speaking, filling the oceans with life. No one really knows why the animals started to appear, and scientists have suggested theories ranging from a change in climate to an overall natural threshold reached. For example, some scientists believe temperature or oxygen levels reached a point that allowed the proliferation of organisms. By looking at the genes preserved in and common to modern animals, researchers are trying to determine a possible cause. One study found that an ancient common ancestor—a worm-like animal from which most of the world’s animals were derived—had special genetic machinery that was so successful that it survives to this day. These genes, used to grow appendages (arms, legs, claws, fins, and antennas), were operational at least 600 million years ago. With appendages, animals swam faster, grabbed tighter, and fought with greater efficiency, and, thus, they could eventually dominate the globe. 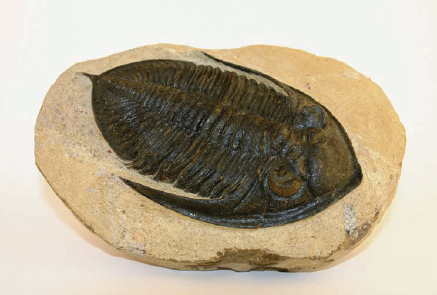 Trilobites were one of the most successful creatures to ever inhabit our planet, with some 15,000 species that survived from the Early Cambrian through the Permian periods (iStock).